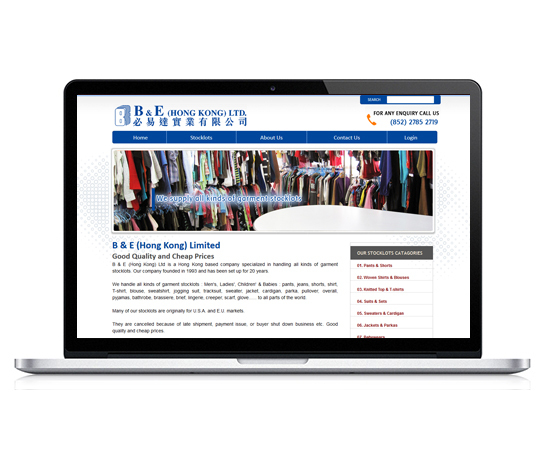 B & E (Hong Kong) Ltd is a Hong Kong based company specialized in handling all kinds of garment stocklots. Our company founded in 1993 and has been set up for 20 years. We handle all kinds of garment stocklots : Men, Ladies', Children & Babies : pants, jeans, shorts, shirt, T-shirt, blouse, sweatshirt, jogging suit, tracksuit, sweater, jacket, cardigan, parka, pullover, overall, pyjamas, bathrobe, brassiere, brief, lingerie, creeper, scarf, glove. to all parts of the world. Many of our stocklots are originally for U.S.A. and E.U. markets. .